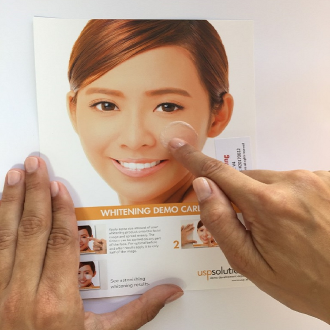 USP Solutions’ Skin Whitening Card is a reliable and easy-to-use test which appeals to your consumer’s senses – enabling them to touch and feel your brand, thus emotionally engaging them. 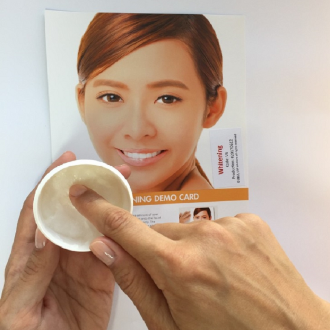 A pea size of the whitening cream is applied to the card. Once the cream is applied the skin tone will brighten within 10 to 15 seconds. The result: a lighter and more even skin tone. When consumers learn about the efficacy of your whitening product they experience an “A-ha” moment. This emotional experience is also referred to as “Beauty Moment of Truth”. 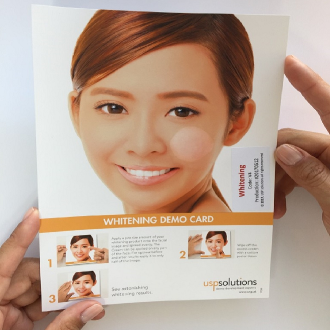 The Skin Whitening Card, therefore, creates an engaging consumer experience whilst simultaneously proving a product’s claim – essential when it comes to brand trust and brand loyalty. A lot of beauty brands offer skin whitening products. However, the majority of consumers are unsure which brand to pick. Do all products hold what they promise? How do you get attention and raise awareness in the first place? Most of the time customers feel overwhelmed by the great variety of skin whitening products available. Uncertain about their skin needs, they find it difficult to choose “the one”. Besides, how do they know if the product delivers what it promises? Which product of my favourite brand’s range would work best for my skin? The USP Solutions Test enables your cosmetics brand to design an emotionally engaging and tailor-made “Beauty Moment of Truth”. Apply a pea size of the skin whitening product on the facial image. It can be applied to any facial area. Once applied wait for 10 to 15 seconds. Once the cream has been given 10 to 15 seconds to fully unfold its whitening effect, the facial area to which the cream has been applied appears in a lighter skin tone. For better visibility of the whitening effect, any excess cream can be removed with a cotton pad or towel.